Why does CopyTrans Contacts ask me to enter a password when loading my iPhone data? Home » Why does CopyTrans Contacts ask me to enter a password when loading my iPhone data? Starting with iOS 8 Apple has increased the level of security of personal information stored on your iPhone, iPad or iPod Touch. This means that third-party access to personal information requires your authorization, if you have enabled the encryption of iOS backups in iTunes. CopyTrans Contacts will ask you to enter your iOS backup password, if required. After that CopyTrans Contacts will be able to access all your iOS data including text messages and contacts. You can also check “Save password”, if you would like CopyTrans Contacts to remember your password for the next time. 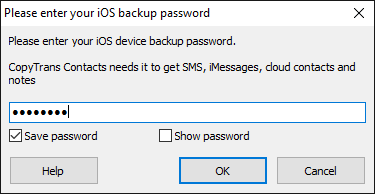 If you forgot your backup password, please refer to this article: I forgot my iPhone backup password.